The DNSODM204_SRAM1_8V is a SODIMM module that can be installed in a 1.8V-compatible 204-pin DDR3 SODIMM socket. This module contains 8 separate SSRAM memories. There are 2 ranks of 4 chips. Each memory is the GS81284Z18 in the 1.8V version. The SSRAM is 8M x 18, so the module configuration is 16B x 72-bits, totaling 144MB. The JTAG chain is connected. All SSRAM functionally is maintained including, pipeline, flow through NtRAM™, NoBL™, and ZBT™. The DNSODM204_SRAM1_8V can be used on our Xilinx Virtex-Ultrascale products using the DNBC3_SODM204 for DNVUF4A, DNVUF2A, and DNVUF1A. It can be used on our Xilinx Virtex-7 products using the DINAR1_SODM204 for the DNV7F4A, DNV7F2A, DNV7F2B, DNV7F1A. Our Virtex-6 products have native 204-pin SODIMMs: DN2076k10, DNV6_F2PCIe, DNV6F6PCIe, and DN-DualV6-PCIe-4. 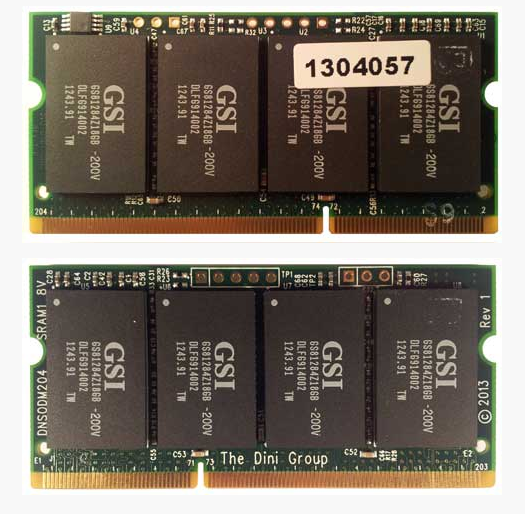 Also, this memory module can be used natively on our Intel/Altera Stratix-V blockbuster DNS5GX_F2.